​​Houston Astros' outfielder ​Josh Reddick tied the knot with his fiancée Jett Elkins over the weekend and their wedding looked outrageous. 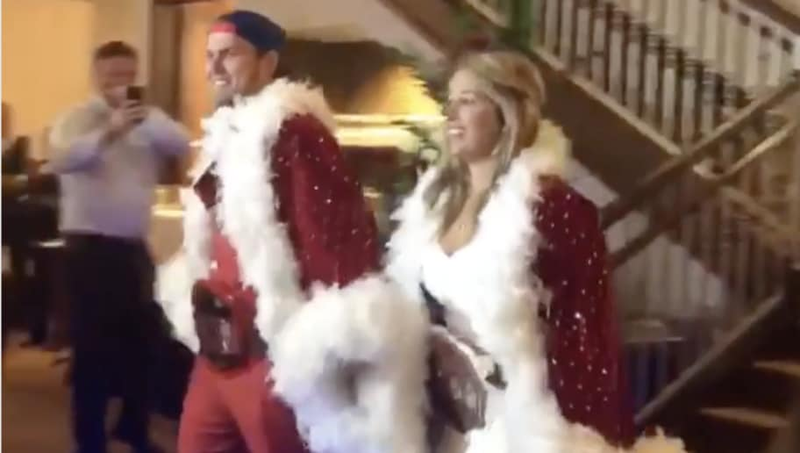 The pair made quite an entrance as they were dressed up in Christmas robes and sporting WWE belts over their wedding attire. Reddick initially proposed to Elkins at NASA's Space Center in Houston back in June of 2018 and they rung in the new year by celebrating their wedding. Reddick had a blast, wearing a Spiderman onesie underneath his Santa Claus-themed ensemble. The newlyweds were flaunting their WWE belts as they walked throughout the resort at Jekyll Island in Georgia. They high-fived guests as they passed by them after showing off their huge belts and hilarious outfits. The Astros' outfielder slashed .242/.318/.400 in 2018 appearing in 134 games for the team. He crushed 17 home runs and drove in 47 RBI while he battled for an everyday spot in the team's stacked lineup. Reddick got off to an awesome start to 2019 and fans will be hoping he will be just as successful on the diamond this coming season.